Winter is the worst. At least, that’s what the dragon kids think. All their favorite baubles from their hoard are encased in a thick column of ice, and spring is months away. Luckily the dragon dad is hands-on, and he’s willing to use his fire breath to get the gems out. 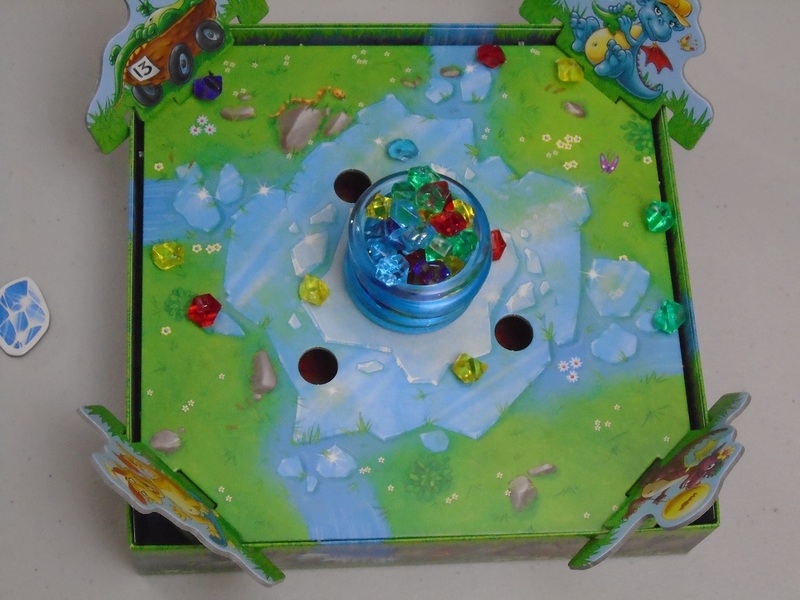 But can the kids use their wits (and eyeballs) to predict which gems will fall with each blast? 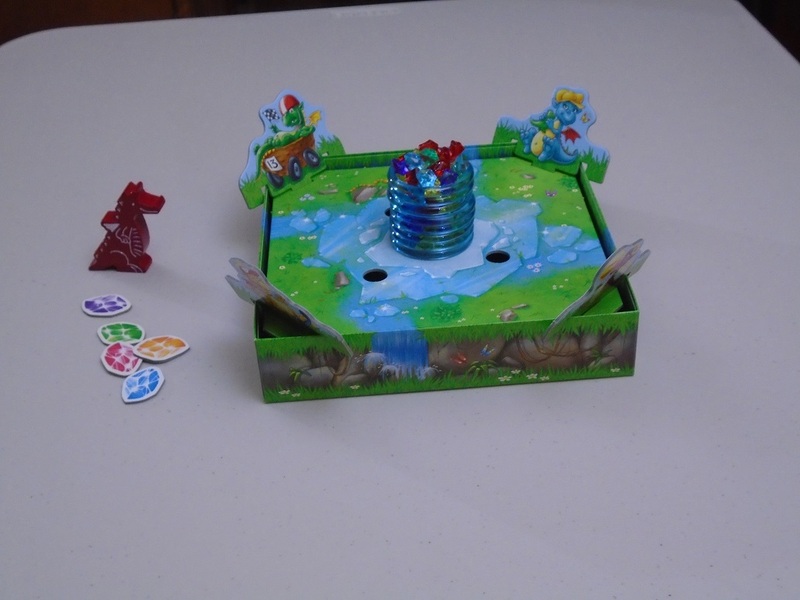 Dragon’s Breath is a speculation/dexterity game for two to four players. Players are dragon kids trying to collect the gems that fall from the ice column when the dragon dad breathes his fire breath on the ice. The player with the most gems wins. Dragon’s Breath set up for four players. 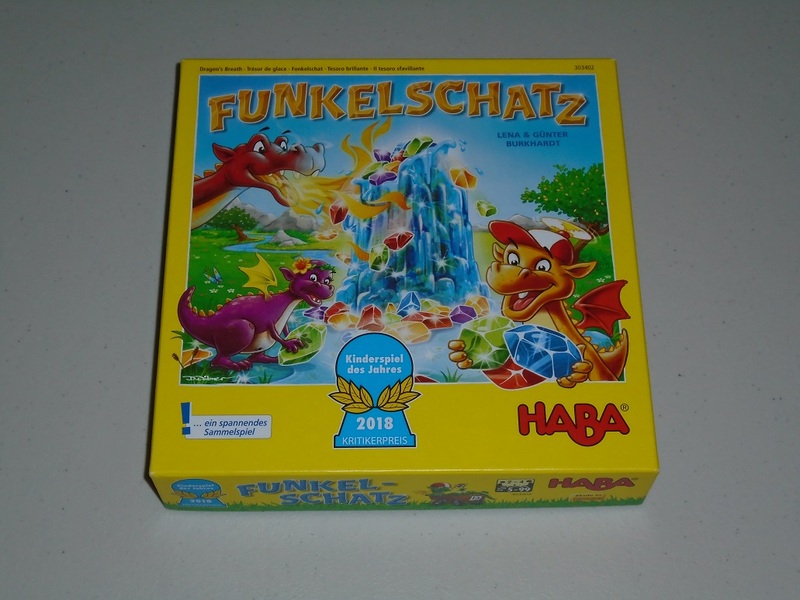 To begin, each player chooses a dragon and a corner and sets up their cave. The ice column is set up for the number of players, and the gems are poured into the center of the column. One player is selected to be the dragon dad first. Play begins. On a turn, starting with the player to the left of the dragon dad, each player chooses a color of gem that they will collect this round. Once every player has chosen a color, the dragon dad player lifts the top ring off the ice column. (The dragon dad player can maneuver the ring a bit to try to get gems to fall or stay in the column.) 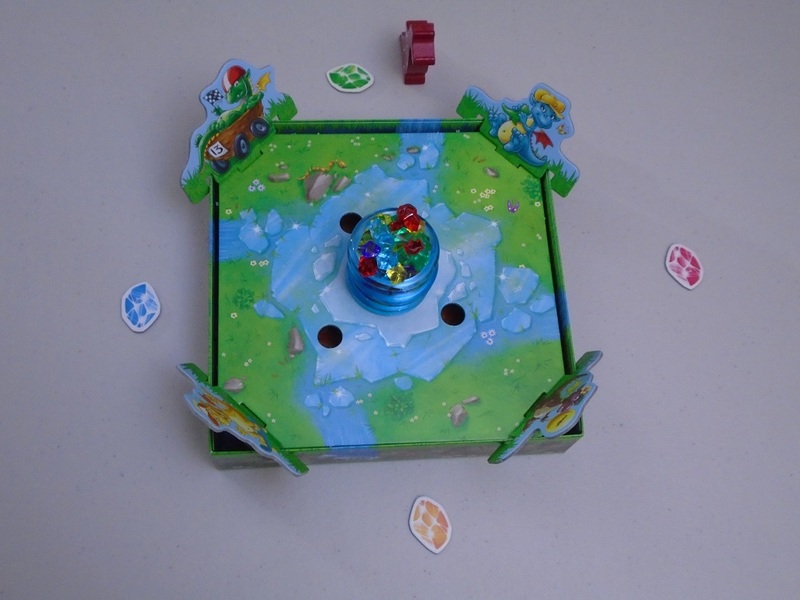 Each player collects their color of gems and places them in their cave, with any other gems being placed in the board’s holes to remove them from play. The dragon dad figure passes to the left, and a new round begins. Each player has a cave in which to stash their collected gems. This is a clever setup. The game ends after the last ice ring is removed. Players count the gems in their caves, and the player with the most gems wins. My kids have just started showing an interest in games within the past year. I have three kids–ages six, four, and two–and it’s difficult to find something that pleases everyone. If we play something the six-year-old likes, the two-year-old can’t really play and usually ends up carrying the pieces away or otherwise impeding the game. If we play something the two-year-old likes, it’s too easy for his older siblings. (Although, for whatever reason, the older kids still like playing First Orchard. Even though it’s great for two-year-olds, I have no idea why they still enjoy it.) Young children change so much in their development from year to year that it’s no wonder it’s hard to find a game that will please everyone. This is why Dragon’s Breath is such a remarkable find. While it’s not a game I’ll trot out with my grown-up friends, it is nigh perfect for most ages of kids. There are a few things that make Dragon’s Breath so attractive to multiple audiences. One of them is the components. 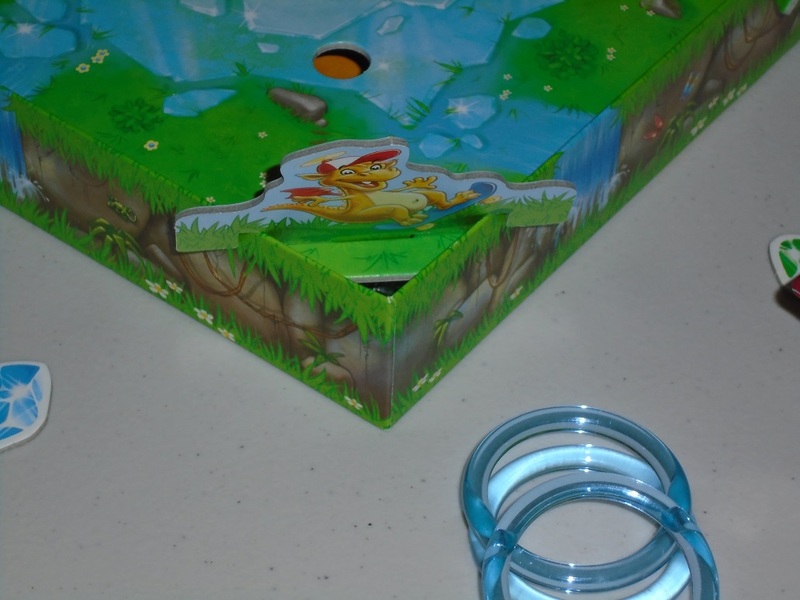 The game is colorful and tactile and eye-catching for little eyes. My kids, at least, love touching the gems and holding the dragon dad figurine, and this is usually okay because the ice rings stay in place even with grabby kids at the table. The rings are easy to remove, and the unsymmetrical shape of the gems makes the speculation of choosing which gems will fall a probability but not a certainty. 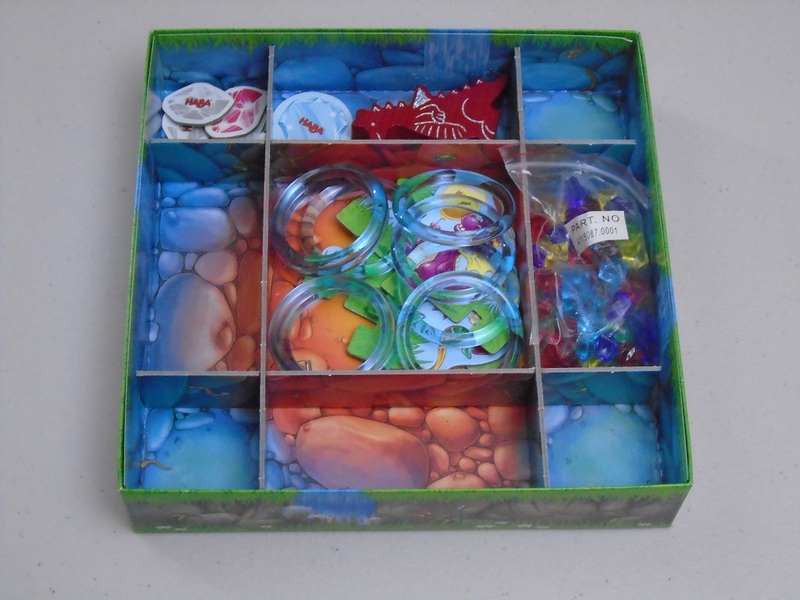 I love that the game involves clever use of the box–the insert divides the box into caves, and everything stores well below the insert–so that it’s not wasted space on the table. Dragon’s Breath is also very clever in its gameplay. It involves very simple speculation that kids can see and understand and immediately get feedback on. The holes in the board leading to the dragon’s cave add a little randomness to the game, which is welcome because it can mildly affect the outcome of the game without swinging the results. The adults usually win when playing with the kids–showing that the game is more skill than luck–but the game’s strategy is also not far outside their grasp. It’s the kind of game they can play and enjoy now and grow into. 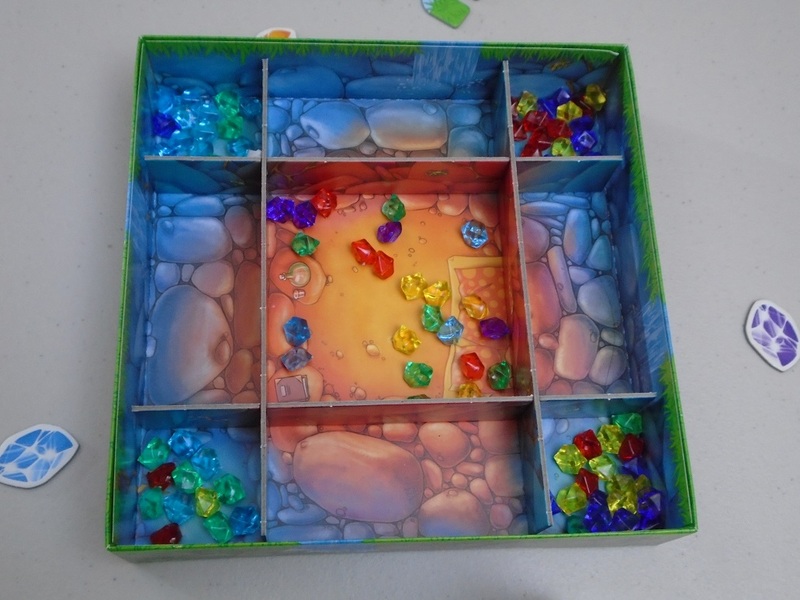 The insert doubles as a divider that holds up the floor and makes it easy to catch each player’s gems in a cave. But perhaps my favorite thing about Dragon’s Breath is how rules light the game is. My two-year-old doesn’t quite have the dexterity to lift the ice rings off the tower, but he can choose a gem color that he wants to collect. While he might not win the game, he can participate, which is more than can be said even of Uno. I like that all of my children can participate in age-appropriate ways. My middle daughter, for example, always chooses her favorite color when it’s available to her. This isn’t a winning strategy (that’s not the color most likely to fall all the way down the ice column), but again, she can get immediate feedback on whether this is a good plan. (This hasn’t led to a different result yet. We’re still working!) My oldest is on the cusp of playing better, and as I said, good speculation is only just outside his grasp. But the fact that we can all play the same game with the same level of enjoyment is an achievement. The underground caves at the end of the game. Dragon’s Breath probably won’t light the hobby games sphere on fire (! )–I don’t think groups of primarily adults will get much mileage out of this one (although it might still be fun for a laugh or two, especially if you maneuver the rings the way the rules tell you you can). But if you game with any children, of just about any age, I think Dragon’s Breath is an ideal add to your collection. I might pass it on someday, once my kids have outgrown it, but seeing how all of them are liking it and growing in appreciation of it now, I don’t think that will be anytime soon.